Posted on 29, August 2016 by EuropaWire PR Editors | This entry was posted in Education, Science, United Kingdom and tagged Bordesley Green Girls School, HiSPARC project, particle physicist, Professor Cristina Lazzeroni, University of Birmingham. Bookmark the permalink. The value of studying STEM (Science, Technology, Engineering and Maths) subjects at ‘A’ Level has been shown to boost girls’ potential earning power by as much as 33%. Encouraging girls to study these subjects at A level has been a long term focus of government policy since 2010. BIRMINGHAM, 29-Aug-2016 — /EuropaWire/ — A pioneering Birmingham school, working in conjunction with the University of Birmingham, has found that getting girls interested in science and research in the 6th form also improves confidence, opens their eyes to new career paths and changes the way they solve problems. 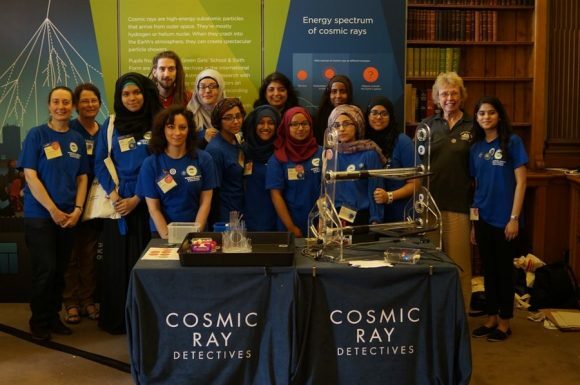 A group of science and maths ‘A’ level students at Bordesley Green Girls School has been working for two years with University of Birmingham particle physicist Professor Cristina Lazzeroni on the HiSPARC project – an international research project which aims to find out more about cosmic rays. Cosmic rays are mostly protons and produce cascades of secondary particles which enter the earth’s atmosphere and sometimes reach the ground. They can occasionally reach extremely high energy, but those that do are also very rare. The findings of the HiSPARC project can make a real difference to the understanding of them, how many of them reach the earth and where they come from. Participating schools build and install HiSPARC cosmic ray detectors on the school roof, with students collecting data which can then be shared via the central computer based in Amsterdam. Nine UK schools are taking part, along with many more in Holland. The first measurement detected by the twelve sixth formers at Bordesley Green was made in Spring of 2015, but the girls can access data captured by over 100 other stations in the UK and Holland and see how it correlates with their own data. The students look for patterns in the data and see if there is any relationship between particles detected during the day and night, summer and winter, for example. The girls’ science teacher Janet Hilton has seen their confidence grow and their understanding of problem solving develop as a result of participating in the HiSPARC project. “The girls had to build, test and calibrate the detectors alongside Professor Lazzeroni, before they could begin to collect and share the data,” she said. “Many practical as well as theoretical problems had to be solved. The initial cohort of students felt like true scientific pioneers – this was something important and the work they are doing is making a difference to our understanding of cosmic rays. At some point an answer will be found, and they will have contributed towards it. It’s not just an academic experiment. The school applied for funding from the Royal Society to help purchase the detector, and last summer were chosen as the only school to exhibit their project in the Royal Society’s Summer Exhibition. In 2016, Year 12 and 13 students also exhibited their work at the ASE Teachers’ Conference and the Big Bang Science Fair at the NEC. Taking part in the project has encouraged several of the girls to choose pure science and engineering subjects as a career path. Many of them have achieved Gold CREST awards from the British Science Association, which has made a big difference to their university applications. The HiSPARC project has also helped the school achieve ‘Word Class’ status (indicative of ‘beyond outstanding’), and it recently won the TES Science, Technology and Engineering Teacher or Team of the Year award.